Home/Seasonal/The 3 F’s to Keep in Mind This Thanksgiving! 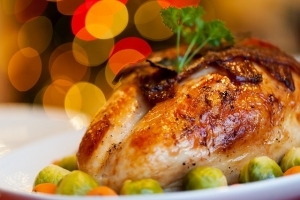 Thanksgiving Day does not have to leave you feeling stuffed, bloated, and fatigued any longer. With so many options and alternatives for traditional dishes that are dairy-free, gluten-free, vegan-friendly, and other -free and -friendly offerings, there doesn’t have to be guilt or physical ailments surrounding this holiday. Below are some suggestions to enjoy the day as well as feel great the following morning. Start the day off with a physical activity – go for a solo jog or involve family members in hiking. This will kick start your metabolism, raise your endorphins, and improve your sleep quality this night. Also, attempt to move a bit after dinner, either going for another walk or putting on some Dance Dance Revolution in your living room ;). Take a few minutes to yourself during this day to pray, deep breathe, meditate, and center yourself. Perhaps do this right before dinner time. It will be especially important to ground yourself if Thanksgiving causes heightened levels of anxiety. It can be tempting to stuff your face and inhale all of the delicious food, but do your best to be present to your food and chew your food carefully. You’ll notice that you feel satisfied and won’t feel as stuffed because you are taking time with your food. You can always pack the rest of your plate up for the next day. Go Gluten Free: there are so many gluten-free options out there nowadays! From gluten-free breads to gluten-free stuffing, and even gluten-free pumpkin pie crusts that taste delicious. Instead of corn or corn bread, fill up on various colored vegetables! And if all else fails, and you happen to stuff your face and feel sluggish the next day, take heart with these Black Friday Detox Tips! Instead of a hearty breakfast this morning, opt for a green juice or smoothie. Have castor oil handy, on Thanksgiving night and for a few night’s thereafter, to apply a castor oil pack to the abdomen. Take a B Complex if you drank alcohol. But most of all, enjoy the day with your loved ones!